digital disruptors who want to guide companies forward in the tech revolution. senior strategists, global innovators and technology leaders. The remarkable pace of recent technological transformation can arguably be pinpointed to one field of study: computer science. The rise of Silicon Valley and the emergence of countless tech companies has dramatically changed how citizens around the world interact with one other, governments and the global economy. As this industry continues to grow in importance and influence, it’s increasingly vital for business leaders to possess cutting-edge technological knowledge in order to keep their products and services relevant. Thanks to this Dual Degree’s combination of the International MBA and the Master in Computer Science & Business Transformation, graduates are perfectly poised to fill the huge demand for well-rounded, highly skilled tech and business professionals. On the one hand, the IMBA provides a concrete foundation in the fundamentals of business, from marketing and strategy to corporate finance and operations. On the other, the Master in Computer Science and Business Transformation imparts an in-depth understanding of the latest tools, trends and technologies. 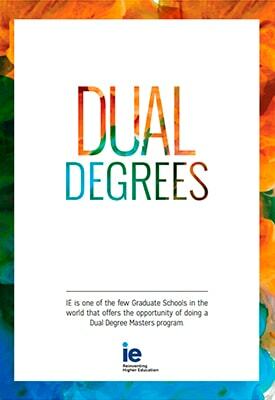 If you choose to pursue this Dual Degree, you’ll transform into a professional who has the unique ability to connect the world of tech and the global business landscape. You’ll become fluent in the languages of computer science and management, and will graduate with unique and complementary skill sets in both fields. After less than two years of study, you’ll have all the knowledge you need to lead technological innovation in your industry of choice—and develop the most disruptive technologies to foster growth for any company. The Master in Computer Science and Business Technology is a University Private Degree from IE University,* taught at IE School of Human Sciences and Technology. The rise of Google, Facebook, Apple… I think it’s proof that computer science is something that solves problems that people face every day.